After my two days in Tokyo, Charles decided it is time for us to venture to the countryside. He wanted to make our Valentines special and organised everything by himself. It is really hard to organise anything in Japan from overseas if you do not speak Japanese. On our way from Tokyo to Mountain Fuji, first obstacle we had to go over was the train station. It is actually not hard once you get in but the problem is if you don’t know where to go, people can’t explain. We finally got on to the express train and enjoyed some of weird Japanese architecture. Japanese people find space very precious so their architecture is more economical and useful than pretty. Most of the houses and buildings are small or slim and very small in size. They follow no regular pattern. For example if you compare it to Amsterdam , Amsterdam is just predictable and beautiful as it still holds a lot of original architecture and therefor it is really recognisable. Tokyo, is complete opposite, it is a house on a house in no particular plan or look. I usually love taking photos of old houses and buildings, and here it was a really big challenge to find any. The only old architecture you can find is probably an old shrine or a temple. To continue 😀 we arrived to Lake Kawaguchiko after driving for about an hour and something little. Charles forgot the name of the hotel he booked. I don’t blame him, I can read Japanese words but this one was really long and complicated. We had some problems connecting to the wifi but finally we arrived to the hotel with a shuttle. 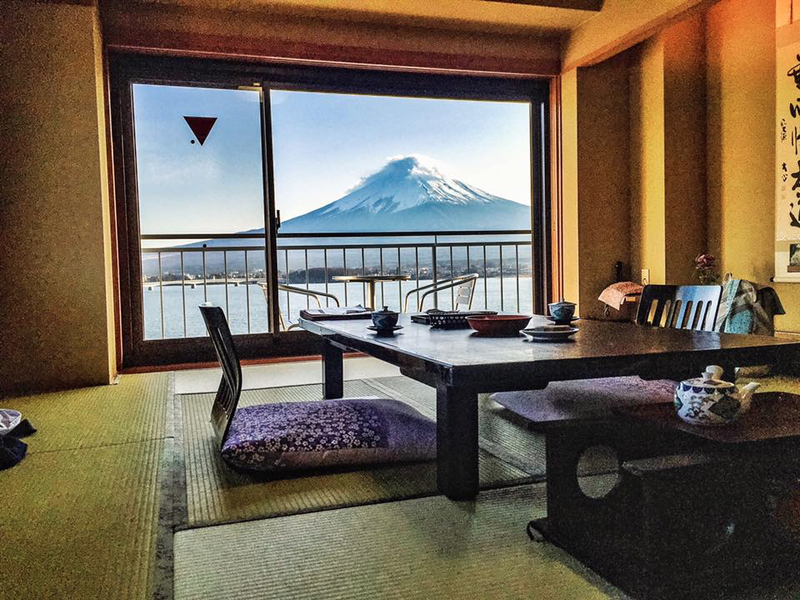 Most of you have seen that pretty photo of that epic view of mountain Fuji from our room, but to repeat here it is again. I was so happy, I am staying in a Japanese room overlooking and amazing sacred home of God’s with the man that I love, on our second anniversary. I felt really special. Our hotel did not have wifi in the rooms, which was a bit strange but good in a way because we actually really got to experience it, without distractions. Charles organised a traditional Japanese dinner to be served in our room. He had some problems conversing with the staff as none of them spoke english. We were confused about the food we were given, and yet again we have learned that we don’t know as much as we thought we knew, and we keep on learning. I still don’t know what I ate, I know some of the things I didn’t like and it was just really really funny. Charles felt a little bit under the weather because he was also confused by the food choices. Fireworks started over the lake and all the people were on their windows watching them. I decided it would be a great time to give my gift to Charles. Valentines is obviously about remembering those we love but I didn’t want to go flashy and buy something ridiculously expensive because it was about us. I got him 10 pairs of socks with a valentines card as a promise that I will never wear them. I also bought him Mozart balls as my dad always bought them for my mom then he ate them 😀 which is exactly what I did. 2 years ago Charles and I have put wish bracelets on to each-other. We had to put a bracelet on the other person and the other person would make a wish. If the bracelet ever was to fall, get lost or brake it would mean the wish has come true. Charlie told me to close my eyes so he can give me my gift. He asked me ”do you sometimes trust me to make right decisions for you when appropriate?” , I said yes, then I felt him cutting my bracelet off. I screamed a little bit inside remembering what I wished for…. Then I became all serious. I knew what he was about to do. He said a couple of things later which I will not share here because they are very special to me and I want to keep something to myself. Eventually he asked me for my hand in marriage and I jumped on him not responding just crying. I said yes 😛 and we were laughing like idiots. You would have found out sooner or later, I was never going to keep it a secret. I am very happy to tell everyone that I will marry the man that I love and have no reason to hide it as if it was a big secret. I was trying to find the best way to tell this to everyone and I needed to tell my family and friends first. Now that everyone close to me knows, I am okay with letting everyone else know. Charlie has really always been there for me, he supported me in my thoughts and emotions, he loved me and he tolerated me. It is not easy to be my boyfriend and it is not easy to be his girlfriend. We both lead very hectic lives and they cross over, so being understanding is very important. Since I have met him, he has never stopped trying, he never stopped believing, he never gave up and he never underestimated me. He kept pushing on and on, and on, and I really needed that. I have been hopping this day would come, as would any other girl of course…but I hoped this day would come much before this day, or this year. Sometimes you meet someone completely different from you and you realise it is their differences that make you work harder and better to get the most out of everything. They make you grow up, learn, adjust and improve. I have found all of this, and every morning I wake up grateful to have met such a loving, caring human that understands me. I don’t know what I have done to deserve this, but I am thankful for ever meeting him 🙂 every day with him is truly a blessing. Wedding dates and plans are going to be an interesting adventure and I am really looking forward to it 😀 What dress? where? who? how? ….sounds so complicated but I am sure it will be amazing!